Swimming In Tenerife - there are tons of options! When we consider swimming in Tenerife, the first thing that, obviously, springs to mind is holiday-makers cavorting about in the sea. 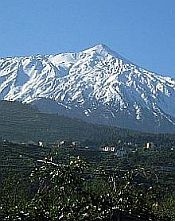 Indeed, Tenerife offers many beaches suitable for this purpose and they are featured in detail on my Tenerife beaches page. Apart from that, there are numerous other ways to indulge in this activity - there's even a Federation of Swimming! I'll detail these on this page. 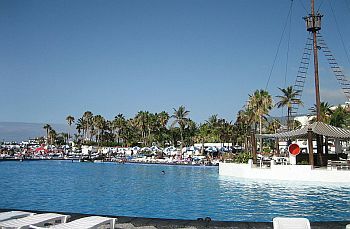 A famous complex of swimming pools found in Puerto de La Cruz. It consists of four sea-water pools and a large, central lake, with sunbathing areas and a selection of bars dotted around its grounds. This is a superbly appointed public swimming pool connected to the Torres Sports Complex, a large, sprawling construction in Adeje, just off the motorway. There are "guided classes" throughout the day for babies (with monitor), children and adults. 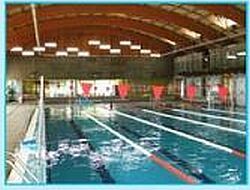 This superb public swimming pool is found in the Complejo Deportivo Jesus Dominguez Grillo, on Camino Sne, a road running parallel to the main dual carriageway from the big roundabout at the Apolo Centre into Las Americas. Is is 50 metres in length and has eight lanes. Each lane is designated as fast, medium or slow, so you pick your lane according to your ability. It is open-air and heated. At certain times of year, you may find it closed for refurbishments. You find it as follows. You take the dual carriageway from the big roundabout at the top of Los Cristianos and head towards Las Americas. The road passes under a footbridge and you turn right immediately after that. Take the next right and you'll find the Complex on your left. There's ample parking. This is found on Calle San Isidro in Los Realejos in the north of the island. There are establishments dotted about that have excellent pool facilities, but are designated "swimming clubs". I am, therefore, not sure if they're open to the public or not. However, I'm aware that teams of serious swimmers visit Tenerife intending to train and it might be worth contacting one of these places. Found on Avenida Benito Pérez Armas, just off the main thoroughfareAvenida Tres de Mayo, in Santa Cruz. Found on Paseo Luis Lavaggi, next to the Hotel Sol Puerto Playa, in Puerto de La Cruz. These are naturally-formed areas of the sea that are suitable for safe swimming. Indeed, some of them have been converted to be more user-friendly, such as the installation of steps down into the water. Although Lago Martianez has been included in the section above, it is, strictly speaking, a natural pool. Way up on the north coast, where the sea can be quite rough, is this area which contains a selection of totally user-friendly natural sea-water pools. Swimming areas are totally closed off from the ocean and there are ramps to enter the water. This is a quiet resort, a little further down the north coast from Punta del Hidalgo. The rough sea is certainly not safe to swim in here, but there are two natural rock pools that have been adapted for safe swimming. There is also a smaller, third pool for children. There are steps down the rocks to enter the sea, plus a length of decking along the side, where you can dive in. The Bajamar pools have changing rooms. Found at San Juan de La Rambla, about halfway along the north coast, this is a truly natural pool that hasn't been modified in any way. Due to past volcanic activity, these pools were formed when molten lava met the sea. The pool in question is an isolated circle of calm(-ish) water. Even though the water is reasonably user-friendly, you have to be ever watchful for the angry sea on the other side of the rock walls crashing over them. There's loads more to come, believe me!